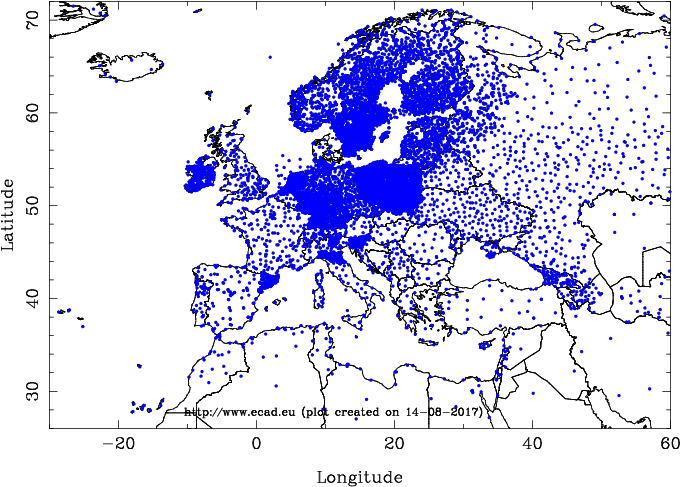 The ECA dataset contains 54232 series of observations for 12	elements at 15563 meteorological stations throughout Europe and the Mediterranean. Both blended and non-blended ECA series are available. Blended series are series that are near-complete by infilling from nearby stations. They are also updated using synoptical messages. Only these blended series are further analysed in ECA&D and used for gridding. Details of the blend and update proces are given in the specific FAQ or in Project info > ATBD. Meteorologogical observations are taken at many stations across Europe, each day. To minimize the effects of changes over time in the way the measurements were made, rigorous quality control is applied before the data is used to analyse extremes. Meta data describing the observation site and instrumentation guides this process. Improving the dataset requires continuous effort.